Ich bin ganz begeistert, dass es funktioniert! Ich stricke mal wieder mit Wollmeise 100%, aber diesmal entgegen meiner Gewohnheit nicht mit 3-mm- sondern mit 2,5-mm-Nadeln, weil ich dachte, dass die Farbübergänge sonst zu lose werden. Auch die Kanten sehen ganz gut aus. Ich stricke jedes Segment in Natur mit andersfarbigen Streifen: Erst „Schwefel“, dann „My old blue Jeans“, dann mein persönlicher Liebling „Dornröschen“ und am Schluss noch „Flaschenpost“. Der „Graf Ratz“, der auch noch in der Kiste ist, wird leider nicht zum Zuge kommen, weil nicht bunt genug. 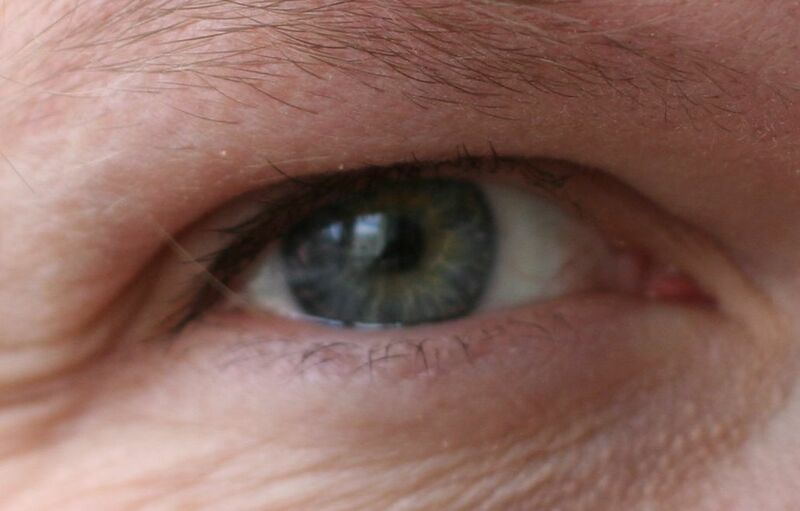 Es ist mir leider nicht gelungen, ein scharfes Foto von meiner Iris zu schießen, aber ich glaube, man sieht die grünlich-gelben Zacken in meinem blaugrauen Auge. Tja, und damit habe ich das Go für Schwefelgrün. Und mit all diesen schönen Farben stricke ich mir jetzt mein ganz persönliches, martinafarbenes Tuch. Freu mich schon drauf, es zu tragen! 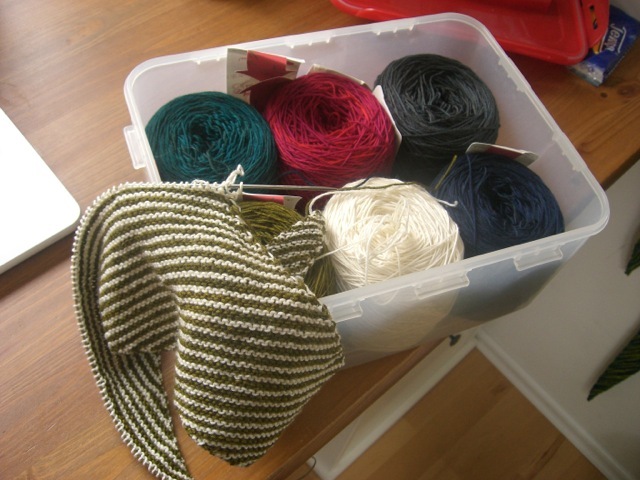 I am making an „Ecken+Kanten“-shawlette for myself, with stripes. Using Wollmeise 100% (again), but this time with 2.5mm needles because I thought the color changes would look sloppy otherwise. And it is turning out really nicely! Each section will be striped in a different color: Schwefel, My Old Blue Jeans, my long-time favorite Dornröschen and Flaschenpost. Those are very special Martina-colors, and it took me a while to find them. Last summer I read „The Color of Style“ by David Zyla, and it really helped me identify the colors I look good in. Other than most color consultants, he does not simply assign you a season but looks very closely which colors you are already carrying with you: the light and dark parts of your hair, the different colors of your iris, the color of your skin when you blush. It took me quite a while, but I finally figured out what those colors are translated into the Wollmeise color world. Yes, those are strands of my own hair (my hairdresser was not too happy about that). And what about that greenish color? Well, if you take a close look at my iris, you will find a yellowish-greenish pattern in there (sorry I could not get my iris in focus, but the color still shows!). So that’s what I am making: a martina-colored shawlette. Can’t wait to wear it! Die Sache mit der Farbberatung hört sich eigentlich ganz logisch an! Ich werde auf jeden Fall mal näher darüber nachdenken. Great blog! I really think your shawls are beautiful! 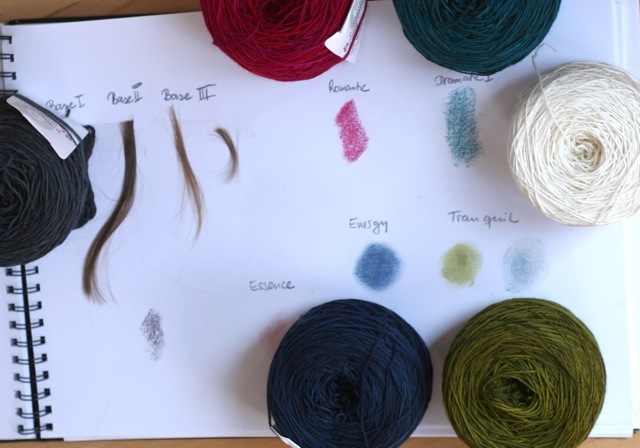 I have marked them in ravelry to make a few and I really liked this post especially regarding colors to use for knitting for oneself! Thank you for having the post in english as well. If you had written this en francais I could have understood. haha! But, I do not know any german so… I am thrilled you do both the english as well!